On Februar 7 the Season 5 of ESL Pro League begins. The League stage of the tournament is separated in a European and American League and will consist of 28 teams, lasting until mid may. The league is being played online as a double round robin, so each team will face every other team twice with best of 1 matches. Only the top 12 teams will advance to the Finals early june, held in Dallas, USA. As of now there is still important information missing about the ESL Pro League Season 5, e.g. regarding the schedule. As soon as we know more, we will keep you updated. If you want that feeling of extra excitement watching CS:GO, try betting on the games you're watching. At least a couple of days prior to the event, there will be odds available. Check out the best eSport betting-sites on the web. 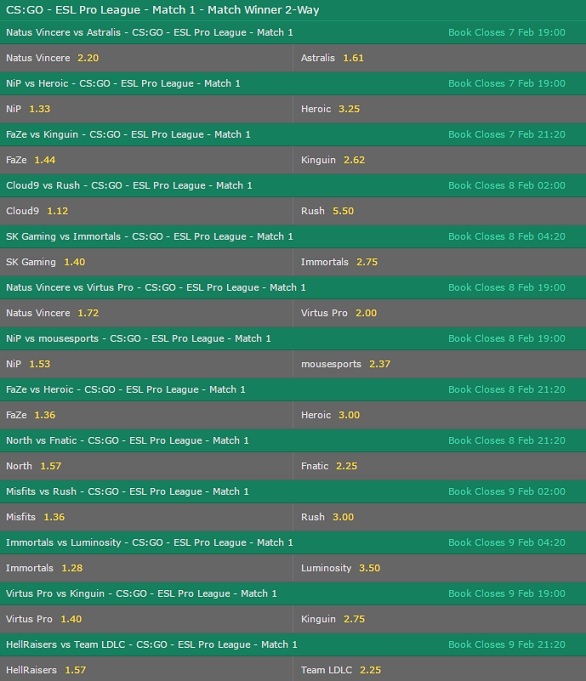 There are currently bets on bet365 available. The bets include moneyline and Winner of 1./16. round. Get more information about the best CS:GO betting sites. Take a look at the betting odds. There are currently bets on bet365 available. The bets include moneyline and Winner of 1./16. round. Get more information about the best CS:GO betting sites. Until now there is no further information available for the Finals of the ESL Pro League Season 5.